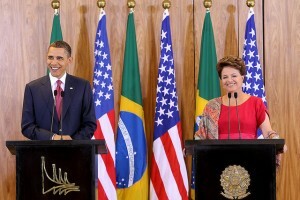 Presidents Obama and Rousseff deserve credit for putting climate change at the top of their bilateral agenda today. Public commitment to a strong Paris outcome from two major emitters that are already taking significant action on climate is more than welcome. Restoring 12 million hectares of degraded forest, as President Rousseff has pledged, is a positive contribution – albeit no more than Brazil’s current law mandates. It is highly promising that the two major economies are creating a high-level working group to move the climate change agenda forward. Particularly interesting is the pledge to develop innovative public-private finance mechanisms both for clean energy and the forestry sector. It is however, disappointing that President Rousseff’s goal on deforestation – to “pursue policies aimed at eliminating illegal deforestation” – goes no further than compliance with existing law. Brazil has already reduced Amazon deforestation by 70% below the historical average since 2005 while increasing soy and beef production, and has an ambitious but entirely achievable goal of an 80% reduction by 2020. Amazon states are taking the lead on reducing emissions from deforestation and putting in place the policy frameworks needed to consolidate these gains. Pará state has adopted a goal of zero deforestation by 2020, while Acre governor Tião Viana affirmed to UK government officials and private investors that Acre can, with adequate support, zero out deforestation within three years. Particularly in light of Pope Francis’s inspiring encyclical on climate change, President Rousseff sells Brazil’s achievements and abilities short in stating that all Brazil will do is follow its own law. President Rousseff has an enormous opportunity for international leadership on climate change, building on Brazil’s impressive success to date and leveraging the progress and commitments by Brazilian states. She should seize that opportunity – and adopt a more aggressive and ambitious national target in advance of the Paris conference at year’s end. Carbon pollution from airplanes creates risks to the general public’s health and welfare, according to a preliminary EPA finding released this week. But the aviation sector itself is particularly vulnerable to the rising seas, higher temperatures, and intense weather events brought by an overheated atmosphere. impaired airplane performance, decreasing how far planes can fly (range) and how much weight they can carry (payload). Airlines and the traveling public experienced the full force of these impacts in 2012. Hurricane Sandy caused the cancellation of nearly 20,000 flights in the New York area, cost the airline industry nearly $190 million in earnings, and did $29 million in damage to federal air navigation systems. Some navigation systems were offline for weeks, limiting the ability of airlines to land in poor weather even after the storm had ended. These hefty risks place serious costs on the airlines themselves, the cities that own airports, businesses that rely on efficient cargo transport, and the flying public. This industry needs to protect the climate for its own sake. Airlines should support tough limits on carbon pollution.